The original story is a sensational one. It's about a factory worker in Buffalo, NY, whose ex-wife married a small-time hood who testified for the government in a case against local Mafioso. Under the government's secret "witness relocation program," the hood was protected against mob revenge by being spirited out of New York and re-established, with a new name and identity, in Michigan. The wife and kids went along. And the factory worker, the actual father of the children, could not discover where his own kids were. This is a terrifying story, a Kafkaesque puzzle that we can imagine being made into a very good movie. But "Hide in Plain Sight" lets us down. 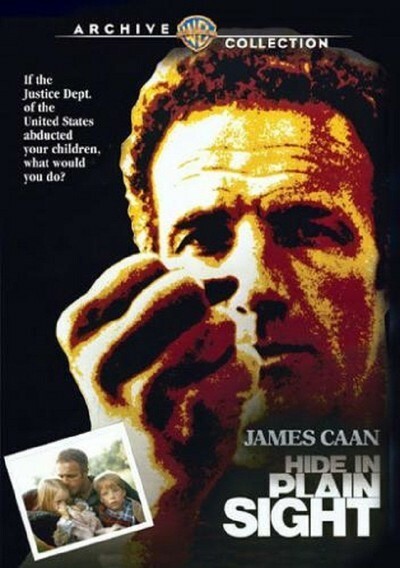 The movie's basic weaknesses seem to be in the screenplay and the direction (with James Caan directing himself in his filmmaking debut). At some point early in the history of this film, everyone should have sat down and agreed on a clear narrative line from beginning to end, one that would have cast the material in dramatic form, established tension, and involved us emotionally. Instead, the finished movie seems to have been made from notes. There are scenes that seem to have been included in the movie only because they actually did happen in real life - not a good enough reason. And, time after time, the movie seems to be building to dramatic climaxes and then abruptly cuts away from them. Two examples: a visit to the hero's congressman in Washington, and a scene in a government office where Caan hurls a telephone and a typewriter around in an attempt to scare a secretary into supplying his kids' whereabouts. Both scenes end prematurely. There are other scenes that do work, but seem unnecessary - for example, the scene in which Caan is laid off at work, and a long scene with two couples conversing awkwardly in a bar. The movie's storytelling skill is so shaky that at times we're not very sure exactly what's happening. After Caan sets off for Michigan, finds a hood on his tail and refuses to lead him to the hostile witness, for example, It's not clear what happens next. Another scene has Caan looking across a body of water at Canada - from Buffalo, of course, although in terms of the film's editing logic we think for a confusing moment he's in Ann Arbor. There's also a problem with the treatment of the character Caan plays. He's portrayed as shy, stiff, too formal in social situations, sometimes inarticulate, with a forced smile. For most of the movie, then, the character is so opaque that we can't be sure what he's feeling. It's not easy to identify with him emotionally, even though we sympathize with him intellectually. Why portray the character as so closed-off? This movie isn't a study of an uptight guy; it's a human story of a father looking for his children. Why allow irrelevant acting stratagems to distract us from the heart of the story? It's too bad the movie doesn't work, because the basic material is powerful, and the, relationship between the father and his children is so easy to care about. The movie's other relationship, a romance between Caan and Jill Eikenberry, provides the movie's best-handled scenes, although even here the movie doesn't take full advantage of the potential: We're never sure how deeply Eikenberry (pregnant with Caan's child) feels about her new lover's quest. We assume she shares his anguish, but that's not the same thing. Here's a movie with such remarkable potential that it's depressing to see it missing so consistently because of fundamental script and directing uncertainty.